A to Z is awarded the Eco-Healthy Childcare Certificate® (EHCC) for providing a healthy environment within our childcare! Conveniently located in a beautiful residential neighborhood in Needham, and neighboring Newton, A to Z Child Care & Preschool has a modern facility that includes fenced-in play areas, attractive grounds, exquisite garden, carefully selected toys and learning materials, music room and an extensive library of children’s books. Our program incorporates the collective wisdom of well-educated caring teachers whose focus is their daily interaction with your child through interesting and meaningful learning experiences, daily routines, and play. Our staff encompasses a broad knowledge of Early Childhood Education, Elementary Education, Special Education, Art Education, Music Education, Social Work, Psychology, Nursing, and Child & Family Therapy. We are interested in attracting that group of parents who care deeply about their role in raising “good people” who will be able to use their skills and talents in an increasingly complex world. We understand the difficulties that parents face in raising thoughtful, caring children. Parents are in the best position to shape family experiences and they know their choices will have definite impact on their children. Our teachers over the past ten years have been committed to helping families in this process. Our School is a place where caring responsible parents and teachers share common values. 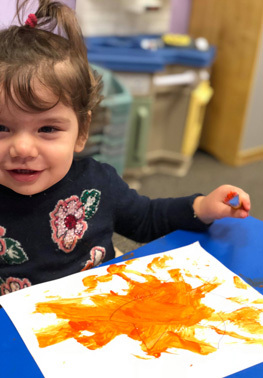 We invite you to visit our program whether your child is a tiny newborn, a curious, active toddler, and enthusiastic three or four year old or an eager, questioning five years old. We are open Monday through Friday, year round. Our Infant and Toddler groups are open from 7:30 am to 6:00 pm, while our Preschool and PreK groups are now open from 7:30 am to 6:30 pm. Download School Year Calendar 2018-2019 here. Our School is conveniently located in Needham and close to Newton, at exit 19B, Route 128, minutes from Routes 9, 16, 135 and the Massachusetts Turnpike.